It was back in 1972 that the State of West Virginia designated the "Apple" as the official state fruit. Then in 1995 it amended the resolution to specify the golden delicious apple. 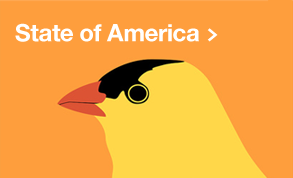 Print Collection has commissioned artist Julian Montague to create our State of America series. These bright, bold, graphic images iconicize the quirky Official State Insignias from around the nation. Red States and Blue States may now be a thing of the past.